An exhibition of contemporary Vietnamese photography opened on January 5 at the Indira Gandhi National Centre in New Delhi, India. Vietnamese Ambassdor to India Ton Sinh Thanh speaks at the opening ceremony. 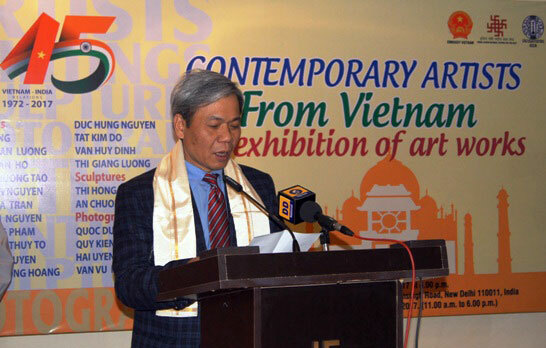 It is the first among activities held by the Vietnamese Embassy in India and the Indian Council for Cultural Relations in 2017 to celebrate the 45th anniversary of the two countries’ diplomatic ties (January 7, 1972 – January 7, 2017) and 10 years of their strategic partnership (2007-2017). The exhibition displays 45 artworks and 45 photographs by 20 Vietnamese artists, featuring the beauty, culture and people of Vietnam. The event and other activities in India will boost cultural relations between the two nations, one of five pillars in the partnership between Vietnam and India, said Vietnamese Ambassador to India Ton Sinh Thanh at the opening ceremony. The exhibition runs from January 5-10./.